Reading to Kids turns 20 years old at our May 11th reading clubs, and tickets are now on sale for our celebration event that evening! 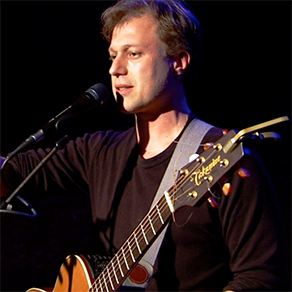 Our comedy lineup now includes Henry Phillips doing a rare, live stand-up and music comedy performance of his famous twisted songs! Also performing are Jodi Miller and Adam Richmond for a side-splitting night of comedy! Head on over to our 20th Anniversary Celebration page to buy your tickets and see all the details so far! We'll be partying like it's 1999 again at the beautiful Historic Woman's Club in Santa Monica, hosted by internationally-known Mallory Lewis and Lamb Chop and her "After Dark" material! Click the above image for our 20th Anniversary postcard to share online or forward to anyone you know who may be interested in going. We'll also have a silent auction, a DJ, and a video presentation. Don't miss this event! Our Amazing Animals & Interesting Environments clubs on April 13th are currently full, but please keep checking for new openings. We need your help finding sponsors and gathering more items for our silent auction at our 20th Anniversary Celebration! To help you get started, here is an explanation of our sponsorship opportunities. For silent auction items, here is information about Reading to Kids to share with potential donors, as well as a donation form for them to complete. Click here for a donation letter to personalize and give to a manager, supervisor, or friend who may be able to donate a gift, product, or service. We especially enjoy awarding gift certificates, amusement park and theater tickets, gift bags, and autographed items! Anything unique is great, too! If you work at or have a connection with products or services to offer, or can reach out to businesses to sponsor the event, then please help by asking for a donation to our anniversary. 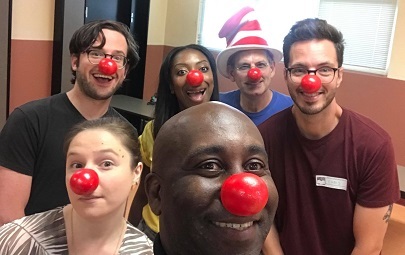 If you personally know or have a solid connection to a well-known, headliner comedian who would be interested and available in performing that night, please email us at info@readingtokids.org. Tuesday evening we were delighted to receive a $2,000 grant check from Target at new Target store 3231! Click the photo above to see the huge check awarded to our Program Coordinator, Jessica Brown-Clark! Did you know Reading to Kids receives about half of our funding from corporation and foundation grants? For example, over the last five years alone six of our volunteers helped us receive $140,000 in grants from their employers! 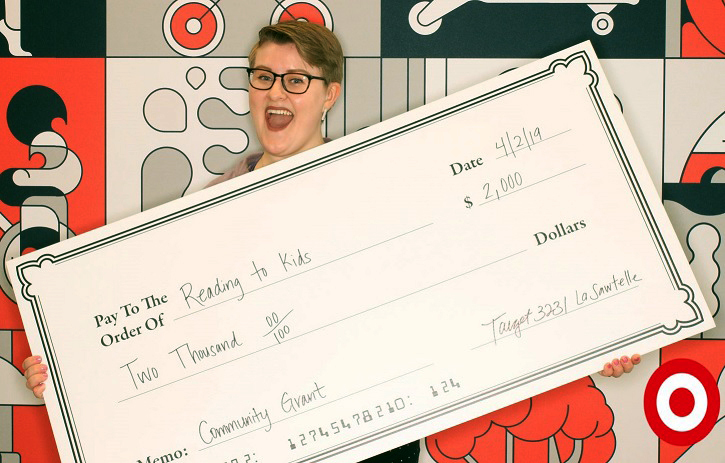 Please check to see if your employer offers grants that Reading to Kids can apply to, and let us know! You may help us buy thousands of books for kids! Thanks, and we look forward to seeing you at our 20th Anniversary Celebration on May 11th! - 3rd Comedian added to our 20th Anniversary! - Thank You, Target! Help Us Find More Grants!